If you’ve got leftover roast pumpkin (or even sweet potato, carrots or beetroot for a bit of a twist) you’re only a boiled egg away from lunch! Salty tamari, sweet pumpkin, peppery rocket and crunchy nori makes a delicious, quick salad balanced with protein and lots of greenery. 1. Preheat oven 200ºC. Place pumpkin on a baking tray, drizzle with oil and season with salt and pepper. Roast in oven for about 40 minutes, until tender and caramelised. Remove and allow to cool slightly. 2. Meanwhile, place eggs in a small saucepan and cover with cold water. Cover and bring to the boil over a high heat. Remove saucepan from heat when it reaches boiling point and allow to sit for 5 minutes, then drain and refresh eggs in cold water. Peel. 3. Toast one side of nori over the heated stove top or flame, keeping it at a safe distance so it doesn’t burn. When bright green and translucent crumble roughly and set aside. 4. 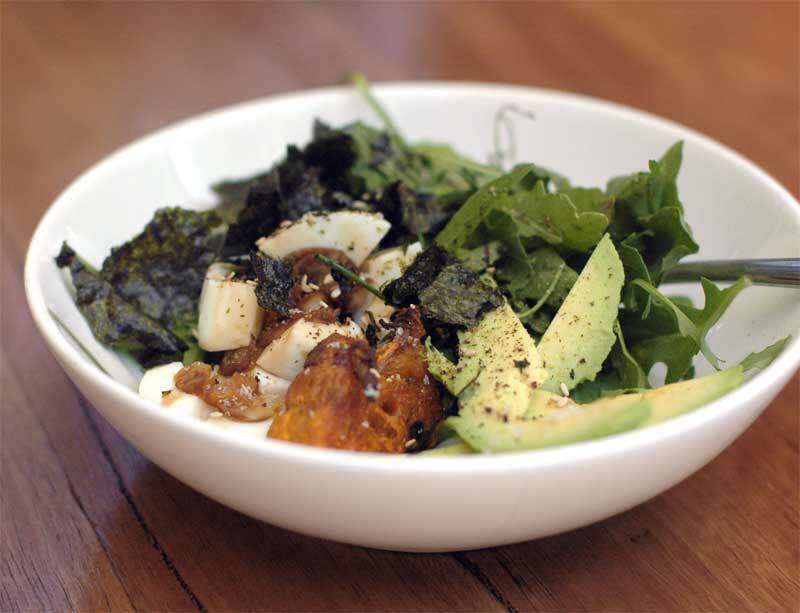 Arrange rocket in four bowls then add the pumpkin, a quarter of a sliced avocado and an egg to each. Combine tamari and lemon juice, drizzle over salad and garnish with sesame seeds, nori and seasoning.